LP fr 1993 London/CentreDate Co Ltd. 828413 "Enchantillion" testpress with handwritten labels, dated 9 March 93. CD us 1993 Qwest 9 45311-2 Subtitled "The limited run...". Comes in a bright orange spongy digipak, with light blue, or grey, lettering. Includes a booklet tucked into a pocket in the front flap. Different silk screening from the standard release. CDR uk 1993 London/CentreDate Co Ltd.
CD jp 1993 Polydor K.K. POCD-1110 Limited edition, includes lyrics and extra tracks, 1500 copies. 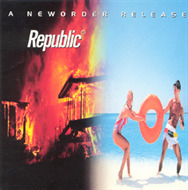 CD uk 1993 London/CentreDate Co Ltd. NO SAMP2 "A NEWORDER SAMPLER", includes tracks from the forthcoming album "Republic". Last four tracks are album versions from previous New Order albums. According to an interview around May 1993 in Select Magzine, Stephen and Gillian said that they were upset that Peter Saville took the design from The Other Two's album, The Other Two And You. They said that typefaces, styles and the inner pictures of Republic's sleeve was originally planned for their album, not New Order's. Received a gold disc award from the RIAA (USA) on March 8, 1994. Written by Gillian Gilbert, Peter Hook, Stephen Morris, Bernard Sumner & Stephen Hague. Engineers: Simon Gogerly, Mike "Spike" Drake, Owen Morris & Richard Chappell. Assistant engineers: Ben Findlay & Sam Hardaker. Recorded & mixed at Real World & RAK. Art Directed by Peter Saville. Designed at Pentagram.